After what some may consider careers in consulting and logistics, we quit our jobs, sold our stuff and left Germany to be full-time travelers and development volunteers. This blog is about our travels, our work as volunteers and our alternative life strategies - always looking to make an impact and to find the meaning in what we do or put some into it if we can't find any. 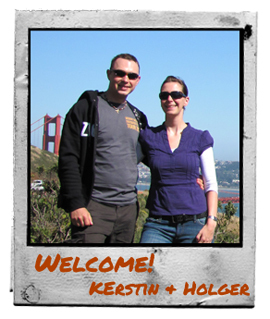 This website is about Kerstin & Holger Heinze - we're two yuppies from Frankfurt Germany who were so sick and tired of our corporate careers that we sold everything we owned to fund a year abroad. We are working as volunteers, first skilled in our fields of expertise and then unskilled for grass roots charities. At the same time, we're on our honey moon doing what we love: Travel, meet new people, go new places. Right now we are in Belize, Central America working for the Red Cross and the Belize Tourism Industry Association.